Auto Measure Spice Rack Carousel $15 Shipped! This Kitchen Art Auto Measure Carousel Spice Rack with 8 Shakers is on deal of the day at eBay today for only $14.99 with free shipping. 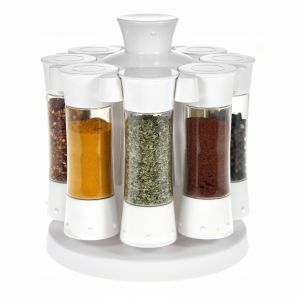 That’s a great price for this rotating carousel and I love the auto-measure dial feature at the base of each shaker that measures spices in ¼ tsp. increments. This deal is for the spice rack only, no actual spices are included.